On December 21, 2017 Lawrence (Larry) went peacefully to be with his wife of 73 years Connie Steed. 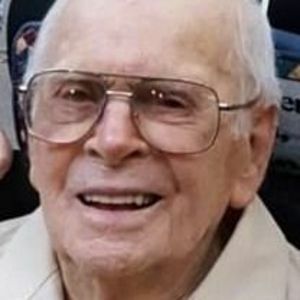 Lawrence was born on August 9, 1921 in Asheboro, NC, Randolph County to the late Clarence Carl and Jesse Spencer Steed. He was a 1939 graduate of Asheboro High School. Colonel Steed was a World War II veteran and retired as Colonel with over 37 years of service to his state of NC and his country, with 5 years active duty with the 30th infantry division (Old Hickory) during World War II and 32 years with the 30th Infantry Division NCARNG with the last 23 years as a full time active guard training assistant. During his 37 years with the active Army and NCARNG and to his retirement date as a Colonel his assignments were always in the training branch. Colonel Steed's last assignment was as Deputy Chief of Staff Operations and Intelligence which lasted from September 7, 1974 until his retirement on October 7, 1979. His plans upon retiring included more time for family, traveling, golf, fishing, gardening and wood working. During his service with the military, Colonel Steed received the Bronze Star, the Purple Heart, Combat Infantry Badge, and NC's Service Medal. He was also to be awarded the Order of the Long Leaf Pine by Governor Roy Cooper. He was also a member of the NC National Guard Retirees. He was a member of Highland United Methodist Church and the Laurel Hills Homeowners Association for over 50 years. Castle Hayne, NC, seven grandchildren, and five great grandchildren. In addition to his parents, he was predeceased by his wife Constance Willis Steed, a brother Clarence Carl Steed, Jr., of Asheboro, NC and two sisters Gladys Trogdon of Asheboro, NC and Juanita Beekman of East St. Louis, MO. A visitation for family and friends will be held on Wednesday, December 27, 2017 from 6:00 p.m. - 8:00 p.m. at Brown Wynn Funeral Home,300 St. Mary's Street, Raleigh, NC . A funeral service will be held on Thursday, December 28, 2017 at 11:00 a.m. at Brown Wynn Funeral Chapel, 300 St. Mary's Street, Raleigh, NC. A graveside service will be held immediately following at Brier Creek Memorial Gardens, Raleigh, NC. In lieu of flowers, please make contributions to Meals on Wheels of Wake County, St. Jude's, USO or a charity of your choice.